Part 60 - Are The Jews To Blame ? St. John the Divine is the headquarters of the Temple of Understanding, an interfaith effort to steer away people from traditional religions to a hybrid kind of spirituality based on New Age philosophies, Neo-Paganism and a mix of organized religions’ traditions. The “friends” who have assisted the founder Juliet Hollister include John D. Rockefeller II, the XIV Dalai Lama, Pope John XXIII, Eleanor Roosvelt, UN Secretary-General U Thant, International Planned Parenthood and the Jewish Theological Seminary. The Temple has received full UN accreditation and has been a key actor in the “spiritual” department of the UN. Twelve individuals listed as Directors or Advisors of the Temple of Understanding are also members of the UN’s Global Forum councils. Those Forums have received numerous speakers who’ve openly supported a neo-pagan world religion based on Earth worship. James Lovelock, one of the speakers mentioned that “Gaia” (an ancient term describing the Earth as a Goddess) was the giver of life and had the capacity to heal herself. He describes humans as being cancers to Gaia, an “illness too overwhelming for her to heal herself”. In other words, humans are parasites to the goddess Gaia. God = Earth = Earth is God ! If you read my article about the Georgia Guidestones or the Denver International Airport, you’re already aware of unusual monuments and art placed by powerful yet secretive groups calling for a new type of global spirituality. Key words or expressions are often used to make this religious shift socially acceptable: “Peace” , “balance with nature” or ”harmony with the infinite”. How can you be against peace? You can’t. Those buzz words hide however the means that will be used to obtain those objectives: “Peace” will only happen when all there will be a single world government. “Balance with nature” will only happen when the world population will drastically decrease and “harmony with the infinite” will only happen when the world will give up traditional religions to embrace neo-pagan humanism. An example of this is Madeleine L’Engle’s courses given inside the Cathedral (she also is one of the founders of the Temple). Her teachings include shamanism, out-of-body experiences, astral projection, Tarot methods of fortune telling, earth worship, psychic abilities, yoga, Tantric Toga (sexual form of Black Magic) and astrology. Almost all of those practices have been severely condemned by Christianity for centuries yet they are being accepted within the Cathedral. Those types of courses are being promoted in various religious temples across the world. But the main value that needs to be globally accepted is environmentalism. [Link to all postings this site under Agenda 21]. By creating a sense of urgency and fear regarding the degradation of Nature, it is easy to pass laws that would be otherwise unpopular, to raise taxes for the sake of environment and to shift the masses’ focus from their respective religions’ laws to the worship of the Earth. People embracing this New Age spirituality are more likely to accept controversial projects like Planned Parenthood [ Link to Abortion: A Money Making Industry - A Modern Day Holocaust includes testimonies from ex-abortionist] eugenics. When Nature is your religion, you see human life as a parasitic presence and more likely to rationalize the death of masses of population. Don’t satanic rituals make fun of Christian rituals by distorting them? Well that’s as distorted as it can get. Processions are a pagan tradition like the “Procession of the Prechten” in Germany, which is very similar to the one at St. John the Divine in many ways. Link here to view Pagan Holidays: Halloween this web site. “…for such are false apostles, deceitful workers, transforming themselves into apostles of Christ. And no wonder. 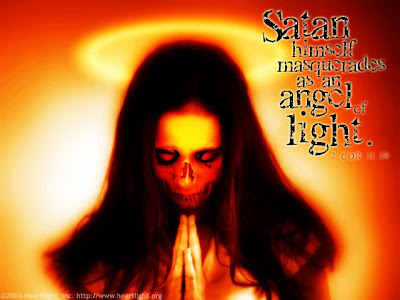 For Satan himself transforms himself into an angel of light. Therefore it is no great thing if his ministers also transform themselves into ministers of righteousness, whose end will be according to their works” -(II Corinthians 11:13-15). “We must move as quickly as possible to a one-world Government; a one-world religion; under a one-world leader” -Robert Mueller Assistant Secretary-General of the United Nations (UN) for 40 years﻿. Robert Muller drew up a World Core Curriculum which included a "Framework for World Media Coverage", a "Framework for Planetary and Cosmic Consciousness" and a "Framework for the Arts and Culture." Bailey and her 2nd husband (a 33rd degree Scottish Rite Freemason) parted ways from Theosophy and started the Lucifer publishing company to publish her books. Changing the name of the company to Lucis Trust was but the first step in the trust's road to becoming a force to be reckoned with in the international community. Lucis Trust is a powerful institution that enjoys "Consultative Status" with the United Nations, which means a close working relationship with the U.N and influence with powerful business and national leaders throughout the world. 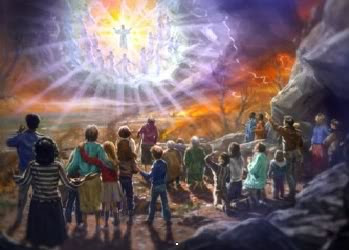 In fact almost the entire purpose behind all of these organizations is to prepare the world for "the return of the Christ" , a concept that has little in common with that of mainstream Christian churches. They do NOT recognize the deity of Jesus Christ . . . And who is this ‘Christ’ they look for. . . the antichrist ! Alice Bailey spent most of it working out what she referred to as "The Plan." The results of which, influenced the birth of many New Age groups: The Church Universal and Triumphant, Benjamin Creme's The Tara Center, the Robert Muller Schools and The Temple of Understanding, to name a few”. For the last 125 years, New Age leaders worldwide have followed the false light of Theosophy; they now whisper sweet lies into the itching ears of the powerful - politicians, media moguls, UN officials, foundation grant-makers, and Anglican bishops alike. PRAISE GOD, JESUS IS COMING SOON !